I was asked in an interview recently what the best cities for Cycle Chic are and it was a good question. I figured I'd whip up a Top 5 List of the Cycle Chic'est Cities on the planet. I limited the list to larger metropolises. Being a Cycle Chic Metropolis requires, basically, two elements. A high fashion bar among the population and... bicycles. It requires that a city has a developed bicycle culture, meaning that the bicycle is an important and respected transport option that is used by regular citizens. Citizens who don't identify themselves as being 'cyclists' or members of a sub-culture but who merely use a bicycle to get around. In many ways, Cycle Chic is synonomous with Mainstraim Bicycle Culture. This probably doesn't surprise you, but we're going with Copenhagen at #1. The reason, apart from the fact that bicycles are an integral part of life in the world's cycling capital, is that the fashion bar is frightfully high in Copenhagen. Copenhageners are simply an incredibly well-dressed bunch. You'll see well-dressed people in every city but in the Danish capital style and textile æsthetics are a fabric extension of the Danish design tradition. If we measure the procentage of a city's population who are well-dressed, Copenhagen is way ahead. Whatever they're wearing, Copenhageners just hop onto bicycles to get around. Crappy, squeaky bicycles, fancy bicycles, cargo bikes, whatever. The city gets extra bonus points for the rather recent development of investing in cooler bicycles. For over a century bicycles were black and heavy. With the economic boom of the last decade, bicycles were all of a sudden available in all sorts of colours and styles. Now Copenhageners can accessorize with their bicycles. At #2, Tokyo. Fashion capital of the planet. Sure, we look to the catwalks of Milano and Paris to see what's coming, but it is in Tokyo that the clothes make an impact. Even the greeters who bow at customers inside the doors of department stores are wearing ensembles worth more than annual salary. 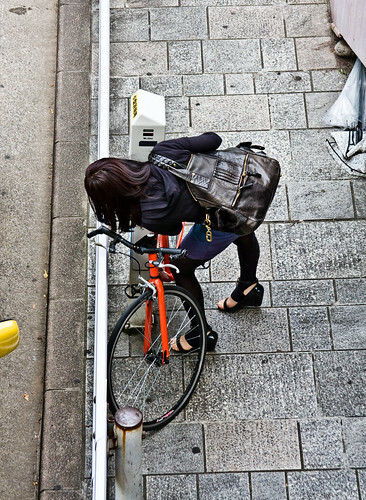 As far as bicycles go, Japan is third only to Denmark and Holland regarding mainstream bicycle culture. Bicycles abound in this major car-producing nation. You'll see more bicycles in the racks around Shibuya Station on any day of the week than you'll see on the streets of New York and London combined in the course of a year. In the 'Well-Dressed Sweepstakes' Tokyo nudges ahead of Copenhagen but loses points on the bicycle front. There is less separated infrastructure for bikes than in Copenhagen and, say, Osaka or Kyoto. Cyclists often ride on the sidewalks, which is great for Style over Speed, but the city would be that much more Cycle Chic friendly with bike lane catwalks for the impeccably-dressed citizens. To be completely honest, it's a tight race in the top three. Amsterdam breathes down Tokyo and Copenhagen's neck on the Cycle Chic Cities list. The bicycle is king in Amsterdam, no doubt about that. Amsterdam and Copenhagen are the Romulus and Remus of modern bicycle culture. One thing that always strikes us about Amsterdammers is their fantastic individual style. They are so cool, unique and relaxed, with a high level of 'urban funk' in their style. We find the Amsterdam affection for clunky old bicycles to be fantastically charming. They compliment their non-chalant attitude brilliantly. Basically, if you don't include Paris on any list that has anything to do with fashion or style, they send a stiletto clad task force after you to blow cigarette smoke in your face and to shrug in your general direction. Fortunately, including Paris at #4 wasn't a difficult choice. Ever since the Vélib bike share programme showed up in the city, the French capital has been under a constant and brilliant transformation to a much more liveable city. Here's a previous Cycle Chic article about the Vélib system's influence on the city. Since Vélib started, 2 million private bicycles have been sold in the city and it shows. So... the city is virtually bicycle-friendly, which certainly counts on the Cycle Chic scale. Fashion-wise... well... it's Paris. The fashion bar is high and the people who are using the Vélib bicycles and private bicycles are people who you would otherwise ride the Metro with. Impeccably-dressed gents and fabulously-fab fashionistas. If the city keeps up it's push for a more bicycle-friendly future, you'll see Paris muscling it's way up this list. We had to think about #5 for a while, but London ended up rolling away with the honours. Cycling is up and coming in the city and there are a lot of positive players promoting it. Much of our decision for the #5 spot is based on a two-day photo gig in the city back in June last year. Sitting outside Lock 7 Café in Hackney and watching the morning bicycle traffic roll past was like sitting in Copenhagen or Amsterdam. It blew us away. Sure, most are fairweather cyclists and sure, there is a lot of lycra about, but hey... it's London, innit. Global city and all that. Fashion centre supreme. "Get on with it, mate" attitude. If there's one global city that has the potential to follow in Paris' footsteps, it's London. From the Swinging Sixties to the Two-Wheeled Teens. So who's coming up fast from behind? What cities are - hopefully - soon reaching a level of mainstream urban cycling and therewith glorious Cycle Chicaliciousness? Three come to mind right off the bat. There is a great deal of effort being made in Toronto to push cycling over into the mainstream realm and already the streets are graced with chic cyclists of both sexes. With the success of the BIXI bikes share system Montreal is following in the footsteps of many French cities by bringing cycling as transport back to the people. 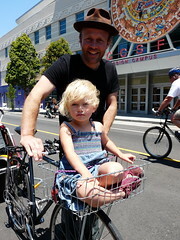 If there is an American city that has the will and the style to reach the heights of Cycle Chic, it's San Francisco. It's where I left my heart. I can't believe you didn't mention Portland, Oregon! Copenhagen's sister city, no less. Brooklyn, NY. Definitely not Manhattan, though. i'm so glad to see Canadian cities in the wings.. if we can just push the helmet debates and safety debates aside and celebrate the joy and passion and sexiness that cycling brings to any city i'll be happy. i'm seeing so many more smiles riding by... can't wait for another year. ..and what a great bunch in San Fran...! Fantastic chicz. I like them when they ride a bike, so cool that they could do what men do. Nice to see Toronto mentioned. Can't wait to get my bike back on the road. 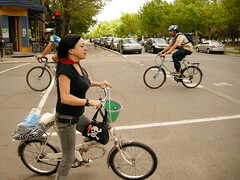 I'm always envious of stylish women on bikes. It makes me sad that I live in possibly the least cycle chic city in the world. Oslo needs to sort itself out. I don't think it would make top 5, or even top 10 actually with such contenders, but have you ever been to Oxford? Plenty of bikes there, mostly students on mountain bikes on the way to lectures, but it does provide some stunning people,on stunning bikes in a stunning city. Plus if you go in the summer, around exam period, you get people cycling around in traditional sub fusc on the way to the examination halls, it looks pretty spectacular. If anyone's interested flickr has a bunch of photos I think, Oxford cyclists should do the trick as a search term. I think you need to recognise that a grubby hi-viz top and waterproof trousers, along with a pair of old trainers, are in fact a positive fashion statement: practical yet stylish. We in Bristol are ahead of the curve, which is why you have left us out. I must join Megan up thread and ask what about Berlin? I would have thought it at least would beat London, but it's been a while since I went to either of those cities, so what do I know. Got to say, Melbourne, Australia is getting some potential. Last time I returned home from Copenhagen to Melbourne, I was a bit overwhelmed by the lycra effect. But this year when I returned I was pleasantly surprised by the increased number of Cycle Chic style bikes, 'real' bike shops (my style bike shops I should clarify), and the increasing number of people cycling in nice, stylish and non-sporting clothing. They have a way to go still, but Melbourne is definitely the top chance in Australia - especially with the increasing number of bike lanes and paths, and the up and coming free bike scheme. I think it will take a lot to get in front of Copenhagen in this list! In a near future, I hope to see Lisbon as a contender. Late in the year, we'll have our bike sharing program running (wishful thinking?) and Lisbon's weather is always on our side. Hopefully, these two factors will boost a (still very weak) bicycle culture. Good Article, loved the flag colours in the names! Love the blog--I agree with Copenhagen as your number one! I used to live there and rode my bike everywhere, in every kind of outfit, at all times of the year! Now if we can only get bike lanes on Manhattan. I am so thankful for your site. While I have lived the cycle chic lifestyle for over 30 years, and have had the luxury of living in some of the cities you highlight, I now live in a area barren of "cycle chic" cyclists. Having your site to refer people to, helps tremendously when I offer the argument that cycling should be and is both beautiful and easy. I think Portland OR should have won a spot as the first commenter stated. They have come a looong way in the last few years and reduced carbon emissions by 20% compared to a few years ago. Not many cities if any over here can say that. Helmets tend to ruin any fashion statement but there are "sexier" helmets coming out I hear! Third vote for PDX. I'm a native San Franciscan and just returned from my hometown.... and I honestly think Portland is leagues ahead in terms of a chic bicycling city. It's just like in the old days - I used to compose my own critical notices in my head. skilfully avoiding the dog turd next to the corner shop." In many ways, Cycle Chic is synonomous with Mainstraim Bicycle Culture. What about Cambridge? (UK). Where cyclists outnumber cars in the city centre, and nobody - NOBODY- wears lycra?? mmmh... ranking stuff... doesn't quite help on promoting ubiquitously bicycle culture. Compliments for the rest on the blog! Also, I have a cycling fashion question. It is well known that etiquette for the front button of a suit's jacket is for the top button (assuming a two buttons jacket) to be fastened while standing, and having the buttons unfastened while sitting, to avoid an ugly drape. But what about while cycling? Freiburg. Freiburg. Freiburg. I'd swap it for London (even Paris). I was there a few years ago, and again, last summer, and much as it's small, you should see the bikes. You should see the fashion. Milan should get a shout ! Really stylish peeps, in sharp clothes on upright bikes keeping cool (in both senses) by not being nerdy 'Tour de France' wannabes. I'd have to give my present, but soon to be former, city a mention. Zürich, with its multitude of beautiful bikes and ladies has to be there somewhere. They even seem to have their own style of bike here, a swiss cross of the french porteur and old-dutch perhaps??? And Basel ain't half bad too! We have many wonderful cycling cities here in Europe. I like the fact you put 3 of them on your list. Vancouver Canada has just overtaken Portland for bicycle mode share!